On November 2014 Microsoft announced their new strategy for the .NET future. 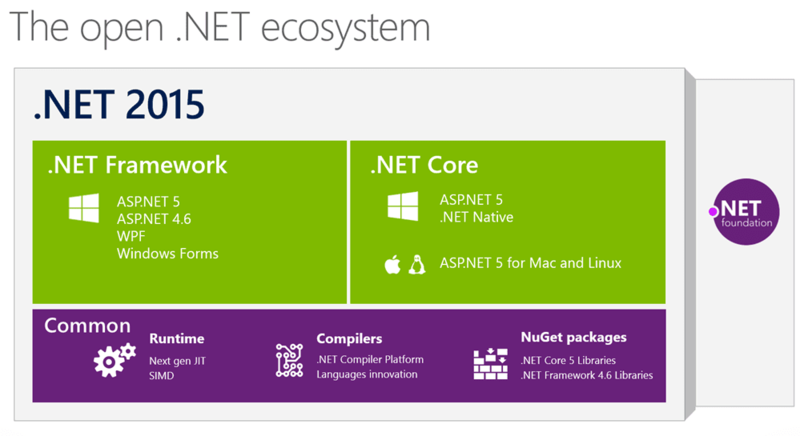 The most important part of the announcement was the release of .NET Core 5 as a componentized framework that will be shipped via NuGet. The .NET Core CLR is open source, and supports Windows, Linux and Mac OS X. It's publicly available in GitHub. You will also notice in the diagram above that any technology that relies on .NET Core CLR as runtime could potentially be used with Mac OS X and Linux. The best examples of this are ASP.NET 5 and .NET Native. In this article we are going to explain how to create your first ASP.NET 5 app using the Sublime Text 3 editor. If you would like information on how to use another platform/editor then visit the OmniSharp website were you will find exact instructions. To install Homebrew open a new terminal window and paste the ruby script displayed on the Homebrew web page. This will create the needed folders, download Homebrew from GitHub and prepare your system to use Homebrew. And you are ready to go for the next step! After you have performed the install a restart may be required to ensure that all of the required dependencies are installed correctly. After installing Package control, adding plugins to Sublime Text is fairly easy. Simply go to Sublime Text 3 and open the command palette [Cmd + Shift + P] or [Tools > Command Palette menu]. Repeat the search operation but this time type OmniSharp in the search box to install the OmniSharp plugin in Sublime Text 3. Once the Kulture and OmniSharp plugins are installed, you are now ready to create a new project. If you were using Visual Studio you would simply go to the File menu and select the new project option. In OS X and Sublime the options to create an ASP.NET project are not available so to make this process easier, you need to use Yeoman and yo generator. To use Yeoman and yo generator you will need to have Node.JS and npm already installed on your system. If you don't have Node.JS and npm installed, just visit www.nodejs.org and follow the instructions to install them. You are now ready to start creating some C# ASP.NET 5 code using the Mac OS X and Sublime Text 3. For this article we are creating a Web application so you will need to select the web application option. The generator will then ask you for a project name and it will create all necessary folders and files. In this article, the name we are giving the project is NetCoreWebSample. The scope of this article was to focus on installation of the software necessary to create an OS X + Sublime Text environment, to enable you to create your first ASP.NET 5 project using the Sublime Text 3 editor. Since the scope does not include detailed information about ASP.NET, we are going to demonstrate the capabilities of the software environment by creating a simple ASP.NET 5 project using Sublime Text 3 running on Mac OS X Mavericks. So let's get started. While you are still in the terminal window, you will need to download all of the dependencies necessary to run your project. Take into account you will need to do this in your Project folder. Download the package and install it. If you receive a notification about your security settings not allowing you to install apps outside the app store, go to Settings > Security & privacy and click on the Install anyway button to continue with the installation (for a detailed guide click here). As you have read in this article, there is a .NET Future - Beyond Windows and it is here today. Just as Xamarin allows you to write code in C# and create native apps for iOS, iPad, Mac, Android and Windows, with Microsoft embracing open source and third party development tools, you can take advantages of the powerful features of C# to develop web sites and web applications without needing Windows, even for development process. Although this technology is still in its infancy, now is the time to begin exploring the powerful features of website development using ASP.NET 5 on the Mac OS X platform because by doing so you will be ready when this technology is ready for prime time. Keep in mind that whatever your development environment is, Plastic SCM is there to keep your code secure. Whether you work on Mac or Windows, you can download the same suite of tools and have your code secure and controlled. For more information on Plastic SCM, visit our website.